I am in love with Scentsy, a company that offers a variety of scented products, from wickless candles to their new stuffed animals. I have always enjoyed filling my home with inviting scents. As a mom, I know that children are curious and a burning candle is a very inviting visual. I worried about the flames, soot and the like that are associated with candles. That is no longer an issue thanks to Scentsy’s wickless, flameless scented wax warmers. · Whether she is trendy or traditional, Scentsy has more than 50 decorative warmer styles and 80 scented wickless candles to choose from – there’s a fit for any personality and style. · As Moms-to-be are prepping the baby’s room, they can keep it smelling fresh with a wickless candle from Scentsy’s Nursery collection or a Scentsy Buddy, a scented stuffed animal that is great nursery décor! · Military moms can show their red-white-and-blue pride with Scentsy’s Patriot collection, which has warmers representing all five branches of the military. 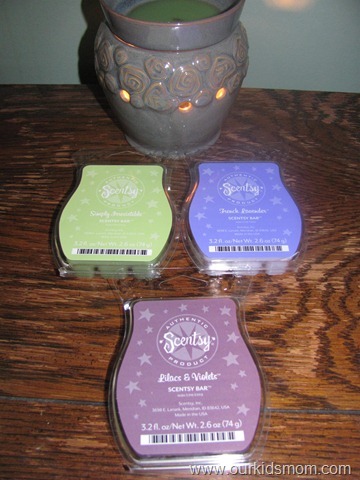 I was sent the mid size warmer Enchanted and 3 scents to try. I prefer certain types of scents in certain areas of my home. Because this was going in my living room, I focused on floral. The green scent is “simply irresistible”: Lavender with a strong, woody background of amber, moss, and musk. The blue is Luna: White florals—jasmine, sweet pea, and freesia—juicy berries, and sandalwood shimmer like moonlight and the purple is Lilacs and Violets: Perfect combination of lilacs and violets—the smell of spring. Please don’t ask me to pick a favorite, because I adore every single one they sent. Do you remember years ago when potpourri burners were the trend? I had one and loved it. The warmers remind me of those. One thing I really love about the warmers is that I don’t worry about them when I leave the room. The warmer works by turning on a light bulb… that’s it. Think of it like a night light. The wax itself will not evaporate, so you don’t have to worry about the well burning dry (like I did oh so many times with my potpourri burners). I only use one little brick to scent the entire room. When the wax loses the strength of scent you desire, simply pour it out and add another. 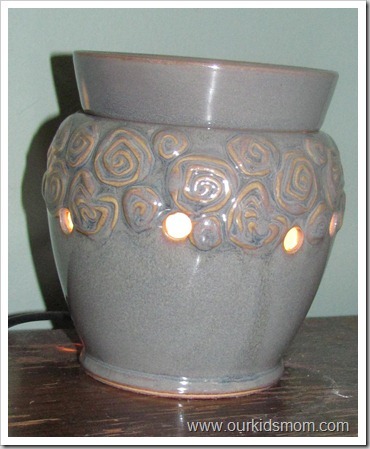 Overall, I love the aethetics of the Scentsy warmers. They are so much more visually pleasing than a jar candle and there is something for everyone’s personality. The “in person” warmer was just as stunning as the one in the catalog. The ease of use is fantastic. Even my 4 year old can turn it on for me with the flick of a switch. There is a wide variety of scents to choose from to suit your mood and the quality of everything is beyond words. You can find a consultant to purchase Scentsy Here. 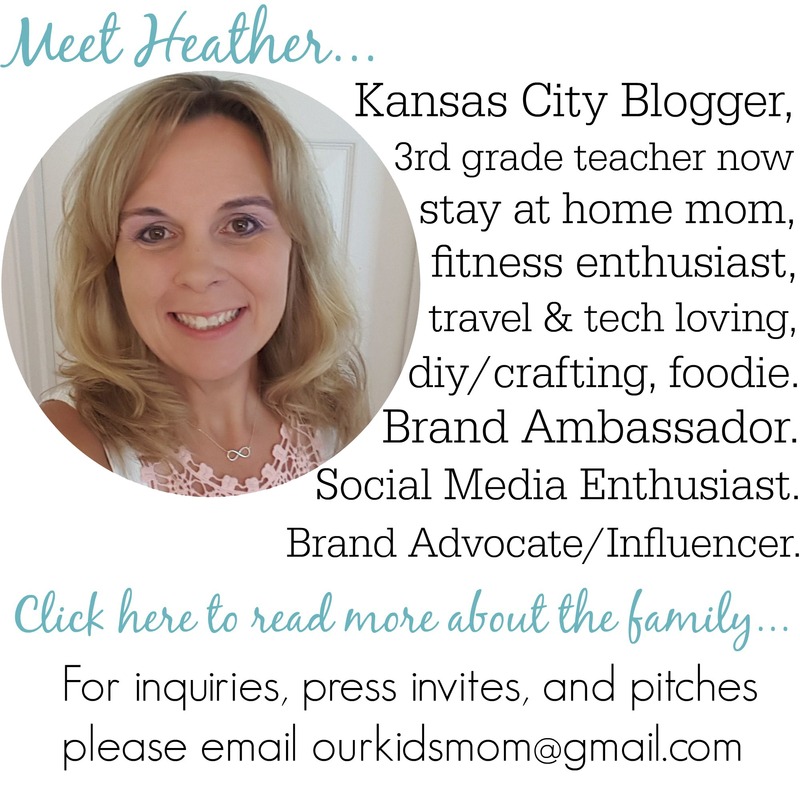 One OurKidsMom reader is going to win a warmer and 1 scent of their choice! This giveaway ended at 11:59PM EST on May 13, 2011. This post was written me and was not edited by anyone. The opinions expressed in this post are entirely my own and have not been influenced in any way. I received a sample for review purposes only. I was not compensated for this post. The sponsor is responsible for prize fulfillment and will be shipping the winner(s) their prize(s). For more information please read my disclosure policy. 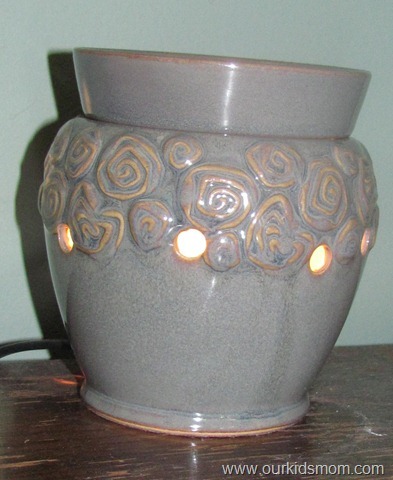 I liked our kids mom on FB, I liked Scentsy on FB and I went to Scentsy and I love the baby’s breath warmer! 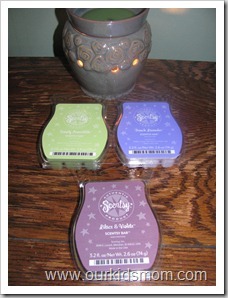 I am also interested in the Scentsy bars Sweet Pea and Vanilla, hazelnut latte, and sugar cookie. They all sound amazing! I also subscribed via email. Thank you!! I like the Lotus warmer! I would love the Green Classic Full Size Warmer! I really want the Angora full size warmer. I like OUr Kids Mom On FB.. I like Scentsy on FB.. I entered your Kalorik giveaway!! 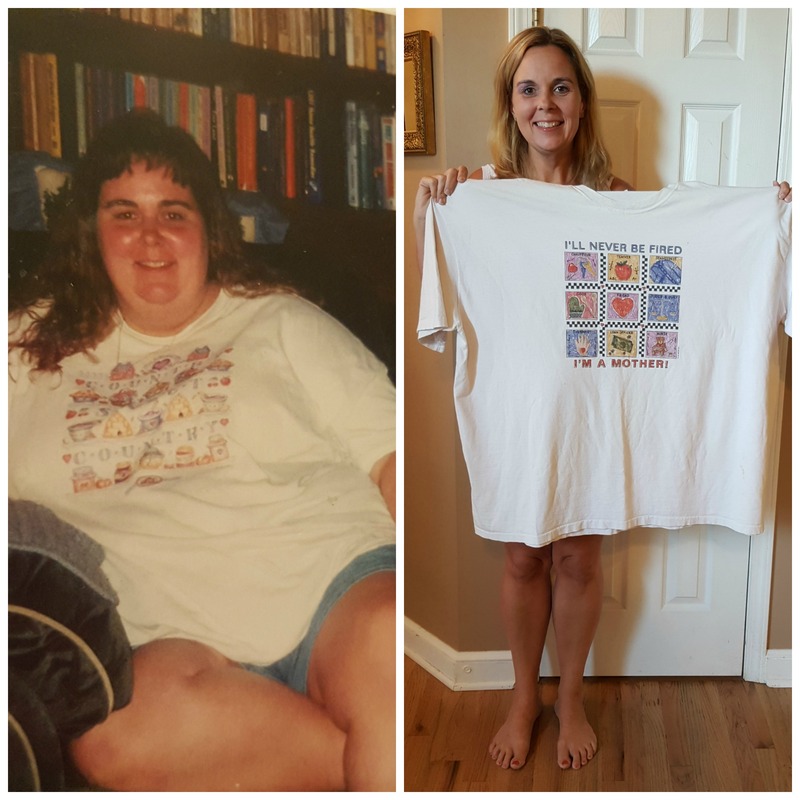 I entered your Truth Be Told giveaway.. I think.. I really hope I did!! I entered your Zak! giveaway! I entered your Tassimo giveaway!! I entered your Xtrema giveaway!! I would like their purple full sized warmer! I like Scentsy on Facebook. I entered your Pampered Chef giveaway. I love that you can pour the wax back in its original packaging and use later! AWESOME! I visited the website, I can’t choose which warmer I love, I like them all! I love the sound of the Cinnamon Bear bar scent! I like the classic green full-size warmer. I would love to have the Boleyn Full Sized Warmer. I like the new Spring scent Flutter. I visited scentsy and learned that they even have night lights! The French Lavender sounds like it would smell heavenly! The warmer I most want is the June special (I think). It is a star shaped. Beautiful! I did really like aprils warmer of the month as well. I would love to try the White Sands bar! I visited the site and found the Scentsy Buddies. So cute! I like all the new choices they have. I like the Navy warmer (little sis is in the Navy) and the LSU warmer (we’re big fans). I would like the room spray in Amber Road. Mandatory is 173. Sorry. 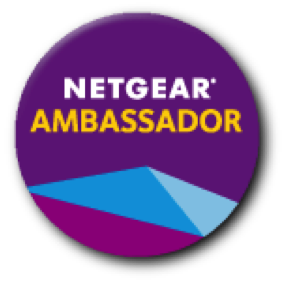 One day I will get all the way through entering your awesome giveaways without being interrupted. Lol. Like Scentsy on FB as well. I want the Onxy warmer and Mums & Marigolds to go with it. I want the shasta daisy plug-in and would like to try the cherry limeade scent ! I love the stuffed animals with the little scent packets inside! I love their Piece By Piece warmer. I entered Gift Card mall giveaway. I entered Dora Mega Bloks giveaway. I have learned that Scentsy has a assortment of product Jar and sprays and I love the differnt Scentsy jar of the Month. i want the Boleyn full sized warmer. i like Scentsy Wickless Candles on fb. I visited the scentsy website! I learned that the Scent of the Month and Warmer are the Month are Ten Percent off!! YAY! I like Scentsy on Facebook (username: Les Cerises). I visited the Scentsy site and I want the Over The Moon warmer, it is sooooo cute! I really like the Caldera warmer from the Cascade collection! I like Scentsy on FB as Jessica Bittke. I entered the WebWatch giveaway. I think I’d like the Paws Warmer & the Cherry Limeade scentsy bar! I love the Charity Full-Size Scentsy Warmer. I love the Arthur Full Size warmer. I entered your Hard Candy giveaway. I like the Riverbed Warmer! I like the Boleyn Scentsy Warmer. Visited the site, and I love their wide selection of warmers and fragrances!! I really like the Rustic Star, English Ivy and Cherry Blossom warmers. I entered your Toys Camp g c giveaway! I entered your FLOR duet giveaway! I would like to have Roarbert the Lion. He is cute! I like the faith warmer. These sound so safe. I hate the soot from other candles so I would be sure to love these. This company sounds proud of its product and that would mean they are quality. I love the Buddies I want to get Ribbert the Frog! I didn’t know that Scentsy also had plug in room fragrances. I want their welcome home scent!!! I like the Apex warmer.